I don't know if I overcame the coordination problems from getting meningitis as a kid, but I sort of dealt with them a little bit. My mom was awesome. We used to have these little square beanbags, so my mom used to throw those at me and I learned to catch those things. I sat between Sachin Tendulkar and Andrew Symonds at the IPL, two legends, and I was just lapping it up. I was like a kid in a toy store. I loved every minute. It was very special. Symonds is a real outdoors person, so him and I got on like a house on fire. We spoke more about fishing than any cricket or anything like that. When you've got 24 okes and you have to pick two teams, I was definitely picked last. Because: can't run, can't catch, make too much noise, irritate most people. When everyone else packed up and went home and it was dark, I was still there, practising. Then I'd make sure I got there half an hour earlier. Brian Murphy got injured, and I'd just had two weeks off. I'd been fishing nearly every single day and then I got the call for my Test debut. And I said: "What? I haven't bowled for two weeks." So I had to grab a ball and get [my wife] Julie in the nets. This was the evening before the Test match against Sri Lanka. My wife was struggling, trying to catch balls, and I just said, "Love, I've got to practise", and I needed her to pass the ball back because then I could get a few more overs in. It was hilarious. It rained for most of the match. Thank God. The 1999 World Cup team was probably the strongest team we've ever had, with Murray Goodwin, Neil Johnson, Andy Flower and Grant, Heath Streak. You could just keep going with the names. It was easy to learn from those guys. Heath had played around the world, so had Murray. Andy had played quite a lot of county cricket. It was fantastic because they just showed you the way to go. They weren't shy in giving you a hard time if you weren't working hard enough. There's no way that I should have played Test cricket or one-day cricket or any sort of cricket, let alone be picked for any side. I think I just wanted it more than everybody else. Sachin Tendulkar was my first first-class wicket. I think the only guys I didn't have out on the boundary were the umpire and the keeper, because Sachin was just bashing it everywhere. But he managed to mistime one to mid-on and got caught by Dirk Viljoen. He took a great catch on the boundary. When I was starting out, we played South Africa, India and Australia close together and nearly all in the same calendar year, so it was brilliant. When you play that kind of cricket all the time, you raise your game naturally. That's what we're missing now. We have such big gaps in between games, and no A cricket at all, absolutely nothing. Our standard of domestic cricket is not good enough to go straight from domestic to international cricket. Not even close. Once you get a label on you, a lot of the selectors just don't think of you as a one-day player. And then suddenly, once I'd played a few one-day games and did well at them, they suddenly realised, this oke can do a bit. It was actually on that tour of India, when I got a five-for, got Sachin out twice in the same Test match, and there were one-dayers after that and Andy Flower went to the selectors and said, "This guy needs to stay." I learned a lot from county cricket, playing with guys like Chris Gayle, Andrew Hall, Phil Jaques, Graeme Hick. Very spoiled. I learned a lot in that time. So it wasn't like I was taking time away from the game, it was just time away from international cricket. "There's no way that I should have played Test cricket or one-day cricket or any sort of cricket, let alone be picked for any side. I think I just wanted it more than everybody else"
When I came back to the team, a few of the players were a bit hostile. Quite a lot of water had gone under the bridge by then, but most of them were fine. Most of them were happy because I probably took some of the pressure off the bowlers as well, because I did a lot of the donkey work with the Powerplays and things like that, so it made it a bit easier for them. My last year at school hurt me so much. I was a batter then, a little bit of a bowler but mainly a batter, and I averaged, I think, about 120 and still didn't get picked for the national schools team. I was gutted. Someone said to me: "Why don't you try and focus a little more on bowling?" And then I did that and it took off from there, and that's how I found my way in. We would often play four spinners and one seamer. I'd have to open the bowling. It was a bit of a nightmare, but I loved it. It was fun to be able to spit on opening batters for a change and have a new ball in your hand. I remember the first game I ever played with my name on the back of my shirt. We were playing at Centurion, and it was Zimbabwe A against the Titans. Before the match, I put my shirt down on the bed and just stood there looking at it. That night I hardly slept at all. I laid my shirt out on one side of this big double bed, and I just kept waking up and feeling my shirt, because I was just over the moon. We were sitting on the beach in Bellito in Durban, and I got the phone call from Shaun Pollock. That was quite a fright, because hardly anyone had my number. "Hello, this is Shaun Pollock", and I was like, "Haha, very funny!" I thought it was a prank. And then he said, "No listen, we need you for the IPL", and I said, "That's fantastic, you can sign me up for about 500 million." 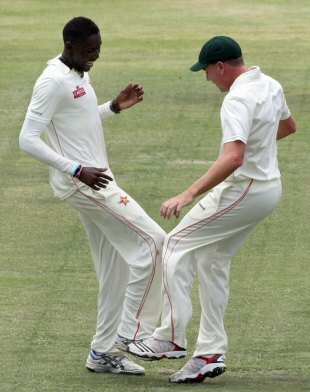 And then he said, "No, listen, this is actually Shaun Pollock", and I was like, "Whoa! Okay, hold on!" In my first game back, I think I got 0 for 34 or something in ten overs. So I was very happy with that. We enjoyed ourselves on tours, going to places we'd never been before. All that experience that I'd had from county cricket really helped me. I always wanted to bowl with a new ball, although maybe at another 110 or 120 kph an hour quicker! I opened the bowling in England quite a bit. I was never a confrontational person, I don't think I'm like that naturally, but when you put the red shirt on and you cross that line and go out onto the field, something happens. I just wish I had been a bit quicker, so I could have knocked a few guys' blocks off. Chris Mpofu and I came up with our dance after we watched the Kenyans do it once. I think they probably do the same dance - we just pinched it off them. They're much better movers than I am. Chris can dance but I'm shocking, so we had to come up with something really basic. We did a few other moves, with some kung-fu and a few other funny things that we saw on TV, watching together. I don't think I'm a robust leader, or anything like that. But I used to follow through and say "Howzit" and "Good morning" to the batsman. Our guys were all like, "Oh hold on, you can't do that", but then suddenly they realised, no hold on, we can. We can stand toe to toe with these guys and we can give it to them, if not verbally then at least body-language-wise. There are a few favourite places that I remember around the country when I'm playing, and a few people as well. There are a few places where I go fishing, around home - Vic Falls, and there's a place called World's View in the Eastern Highlands. I get goosebumps now just thinking about it. 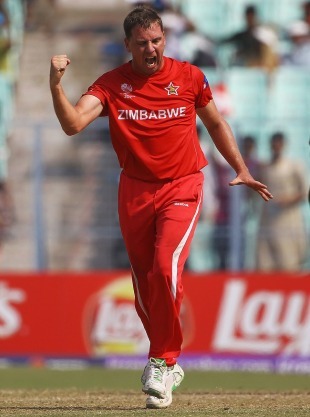 And those are the places that I always remember when I put on my Zimbabwe shirt. And those are the places that you're fighting for. You're not just fighting for yourself, you're fighting for your whole country. After that game when Hayden got 380, I went out onto the field and the stadium was empty and all the lights were on. There were just loads of birds flying around the ground. I went and sat on the roller, and I was just looking around. I was depressed, because I'd just been smashed properly. The stands were all empty, and it was just quiet, and I just sat there thinking, "It's just a game." You play it because you love it, so you've got to pick yourself up and get on with it. Shane Watson and I once had a big brawl up at the middle of the wicket. And the next ball he ran down at me, and I spun one for once, and I think he died of fright as well, and got stumped. I definitely gave him a send-off. It was so much fun, I just loved it. But the worst thing was, after the game Ian Healy came down and he was looking at the wicket. I had my stump in my hand and I was so chuffed with myself. I said to him, "Heals, what are you doing?" And he said, "Oh, I'm just looking for the stone you hit with that ball earlier." Cricket's such a humbling game. I think you know when it's your time to go. I'm very blessed, I don't have a lot of aches and pains in my body. I'm not retiring because I'm sore, or I can't do the fitness test. I wanted to play one more game at Sports Club, to say cheers. When I didn't get selected for those last few games I thought, "No, it's enough now."